“Even though we’re doing the software business, we’re not as good as we are in hardware,” said Kwon Oh-hyun, vice chairman and chief executive of Samsung Electronics. A big problem for Samsung is maintaining software that synchronizes with desktop Microsoft Outlook. Their KIES product ran into great trouble when it omitted sync for Outlook Contacts and Calendar. Those who have tried KIES are left demanding the “rest of their Outlook data” – like tasks, notes, alarms, and categories. If you use Outlook, you’ll want an advanced Outlook app for GS5 that lets you access your full Outlook database. You’ll want a guarantee that when you update records on your phone, they also update MS Outlook on your PC. Will the fifth incarnation of the Galaxy S device muster enough software wizardry to make Outlook sync easy? In the past, Samsung has been off the mark, as noted by Marc Saltzman in his review on USAToday.com. He turned to CompanionLink to solve his Android sync problems. One key driver of CompanionLink’s reliability is that we develop our own Android app to hold the Outlook data structures. Our app, DejaOffice for Outlook, lets us establish a one-to-one map with Outlook data fields. 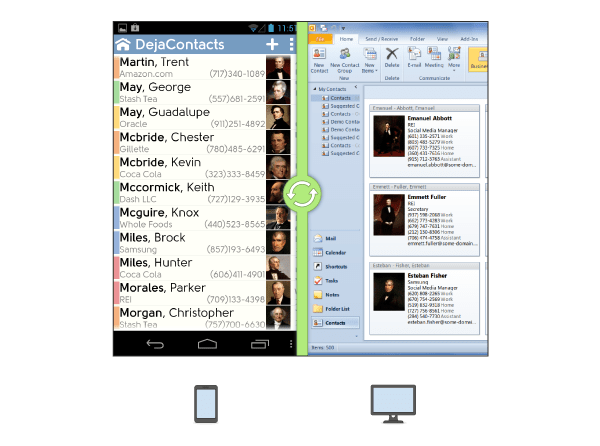 You can also integrate Outlook data stored DejaOffice with the Galaxy S5’s Contacts and S Planner if you have other apps that rely on these stock Android apps. If you value data privacy and prefer not to host your client notes or address book in the cloud, CompanionLink offers the USB connected sync option. Simply dock the Galaxy S5 to your PC and synchronize in a cloud-free environment. Your data never leaves the wired connection between you PC and S5. If you have multiple devices (GS5, Galaxy Note 3 tablet, Apple iPad, etc.) and wish to automate the sync across all devices, you can select the DejaCloud option that comes with CompanionLink paid licenses. The cloud ensures data is automatically updated on all PCs and devices using the same account. If you want the convenience of hands-free sync with the security of a cloud-free system, chose the WiFi sync option. This setting automatically pairs your S5 with the PC running Outlook using your WiFi connection. Your phone and PC must be on the same WiFi network (like in your home or office). More information about Galaxy S5 Outlook sync is available here. Well, try Coolmuster Android Assistant, we can use it to move almost everything from android phone to computer, have a try! I just want the Calendar synch with Outlook. I don’t want all of the bloatware. Possible? Yes, you can enable/disable conduits in Settings>Applications. Contacts, Calendar, Tasks, Notes are all conduits. Having an issue – T-Mobile GS5. USB sync stops at 678 contacts and loses connection. WiFi stopped working… HELLLP!!!! USB and Wifi are the ‘options’ . . .
Q1. But are they only available separately or can you chose either one when the software is running? Q2. Can the computer with outlook on the laptop be ‘teathered’ wirelessly to provide that wireless connection? (for when you are away from your wireless network at home. A1. Both are available in the product as configuration settings. You only need to pay once and you have all the options to choose from. A2. I suppose (using VPN or something similar), but CompanionLink does not facilitate this type of service. CompanionLink will check to see if both device and the PC are on the same IP. Hello, what if I have a S2, S3, S4, Nexus, HTC or some other Android device ? Why go on about just one phone, when the phone is the OS version. I have a S2 happily running Kit Kat for example. CompanionLink supports all devices running Android OS 1.6 or higher. The advice in this article applies to these other devices as well Samsung S5 happens to be the best-selling Android device at the time of writing the article.